Two decades later, and the real world has been kind to the quarterback, even if no one can remember his name. He lives in what can only be described as a sprawling manifestation of the American dream, an enormous stucco house on a tree-lined cul-de-sac in a tony New Jersey suburb. He has a wife, and he has four children, and he has a den with a wet bar and a pool table, and until recently, when corporate restructuring rendered him a temporary stay-at-home father, he had spent 18 years as a star at Merrill Lynch. Hardly a household name, John Shaffer won a national title and lost only one game as the starting QB at Penn State. John Shaffer. The name, like the way he played quarterback, is bland and forgettable, which is why few people outside of the state of Pennsylvania even recall it anymore. 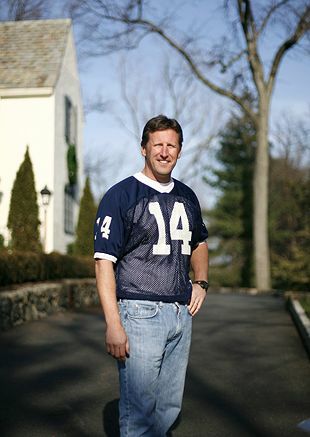 When he graduated from Penn State as an academic All-American in the spring of 1987, he had a national championship ring and a reputation as a solid citizen who had no legitimate shot of making it in the National Football League. He went to training camp with the Dallas Cowboys as an undrafted free agent. By the end of August, he did something that many football players could never muster the courage to do: He asked to be cut. He had a degree in finance, with an internship waiting on Wall Street. He had another life to start. Maybe, he says now, he could have hung around for a couple of years, could have made a roster as someone's second or third option, could have spent that time aspiring to be something he'd probably never be. Maybe, if he had lost that one game, on a January evening in the Arizona desert, he would have felt he had to aspire to something more. Maybe, if he had lost that game, his entire life might have unfolded differently. But that was the thing about John Shaffer: He was one of those quarterbacks who specialized in not losing, one of those quarterbacks you hardly see anymore in major college football, one of those quarterbacks who not only shows up for class but actually cares about his classes, one of those quarterbacks whose job is not to alter the course of the game but simply not to screw the damn thing up. Shaffer was not fleet of foot, and he did not have a prodigious arm, and while he was broad-shouldered and generically handsome, he was not an imposing physical presence. Yet, in all of his games as a starter dating back to the seventh grade, Shaffer won 66 times and lost only once, on New Year's Day 1986, to Oklahoma in the Orange Bowl. This is not the story of that game. This is the story of a game that took place exactly one year and one day later, the last game, the best game, and the most important game Shaffer ever played. And it's a funny thing. Because if you go by the statistics of that night, if you measure a performance purely by the numbers, John Shaffer could not have been worse. WINSTON MOSS, LINEBACKER, UNIVERSITY OF MIAMI: "Their quarterback? I don't remember their quarterback." DON MEYERS, FIESTA BOWL SELECTION COMMITTEE CHAIRMAN: "Joe (Paterno) had this quarterback -- I think his name was Shaffer. Joe told me, 'He'll never get a call from an NFL team.' I do think Shaffer would have a hard time playing big-time college football today." BEANO COOK, COLLEGE FOOTBALL HISTORIAN: "Penn State had less firepower than Sweden did in World War II." DANIEL STUBBS, DEFENSIVE END, MIAMI: "They couldn't throw the ball! All night, we're screaming at them, saying, 'Throw the ball!' They couldn't do it!" But this was not the type of game you could judge by numbers. This was a game that turned every number and every statistical notion and every prediction upside down. This was a game shaped by its own hype and pregame story lines, by its own bloated sense of self-importance, by the fact that it served as a thumb in the eye of the bowl system and its antiquated sense of propriety. -- from left, John, 13, Hayley, 11, Kohl, 8, and Reed, 10 -- in Summit, N.J. This was Jan. 2, 1987, and for the first time, the college football season had been extended beyond New Year's Day. Because of a quirk in the system, because Miami was ranked No. 1 and Penn State was ranked No. 2, and both schools were independents at the time, with no ties to any conferences, meaning no affiliations with any specific bowls, the Fiesta Bowl landed the dream matchup. Before this, the Fiesta had been second-tier, unable to stand up to the cabal of Rose, Cotton, Sugar and Orange, but now the Fiesta Bowl was in the right place at the right time, and so was NBC, which took the radical step of shifting the game to a Friday night and preempting its most popular television show to make room for, of all things, a college football game. Two decades later, the men who played that game have become stock traders and broadcasters and salesmen and coaches and ministers. Some have fallen ill, and some have died, and some have spent time in police custody and some have spent time in the Canadian Football League and two of them, a punter and a quarterback from Miami, have defied the laws of genetics and are still playing in the NFL. But wherever they may be, wherever they may end up, they will remain united by this moment, a game between two teams with such contrasting styles that it felt like maybe something much larger was at stake, that maybe this was a referendum on where American sports were headed, for better or for worse. BRUCE SKINNER, FORMER EXECUTIVE DIRECTOR OF THE FIESTA BOWL: "We had just signed a contract with Sunkist. It was the first title sponsorship of a bowl game. So, yes, I'll take the blame for that. There was a certain feeling that a title sponsorship should not be involved in a college football bowl game. But the Sunkist sponsorship allowed us to be competitive. Those other four bowls, they wanted to keep it as the big four, and I don't blame them for that." 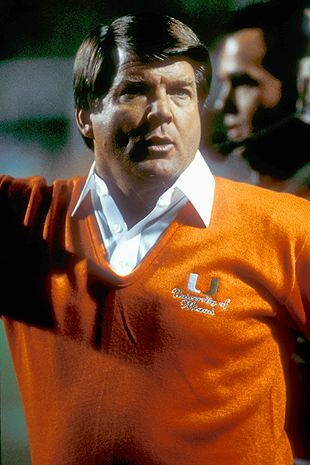 No program carried more swagger in the late 1980s than Jimmy Johnson's Miami Hurricanes. MEYERS: "I started going down to Miami and talking to Sam Jankovich, their athletic director, and the coach, Jimmy Johnson. They said there was no way they were not going to the Orange Bowl, it was right in their backyard. But I kept going down there. We had to come up with a way to match the Orange Bowl's payoff, so we went to NBC and said if we could move this game off New Year's Day and move it into prime time, we could sell ads for a lot more money. They said, 'You're not moving it into prime time, because you're talking about preempting the most popular prime-time show on television. You're talking about "Miami Vice." ' But we sensed that this could change the entire bowl picture in college football. It was a true No. 1 versus a true No. 2, both undefeated, playing on a neutral field. And from NBC's perspective, it could change college football, too." This was his vision, grandiose and bold, and Meyers was unwilling to compromise on the scope of it. He exploited every angle. He stroked every ego. He played off the media. He worked his way up the ladder at NBC, and eventually he twisted enough arms in the entertainment division that they agreed to accommodate him, if he could actually secure the matchup. Getting Penn State wasn't much of a problem. Joe Paterno was 3-0 in the Fiesta Bowl; why wouldn't he want to play there? His team had more than a dozen fifth-year seniors who wanted nothing more than another chance at a national championship after the loss to Oklahoma in the Orange Bowl the previous season. 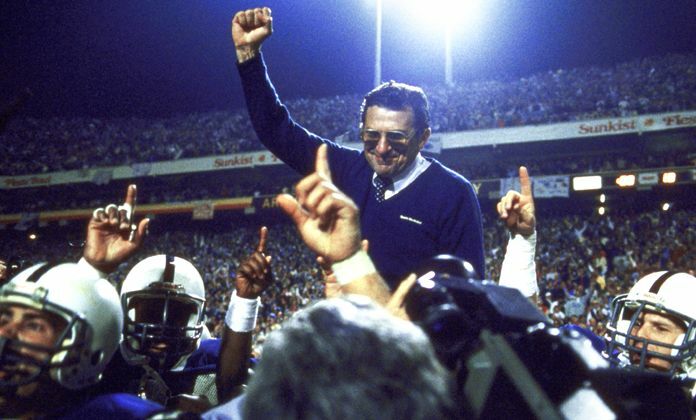 "If we have to play this game in a parking lot in Brooklyn," Paterno told Meyers, "we'll do it." But Penn State was never the No. 1 team that season, and in the end, the decision would not be Penn State's. There was never a question that Jimmy Johnson possessed the best team in the nation that year. The only question, in fact, was whether this was the most talented team college football had ever seen. It had a Heisman-winning quarterback in Vinny Testaverde, a top-flight backfield anchored by fullback Alonzo Highsmith, an unbearably cocky wide receiver, Michael Irvin, and a defense rife with size and speed and bubbling over with attitude. (Even the punter, Jeff Feagles, was one of the best at his position.) This was a new breed of college football team, an NFL developmental squad disguised as amateurs. 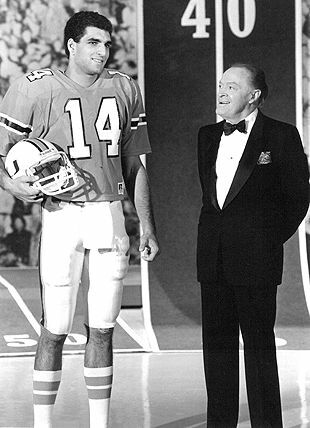 Vinny Testaverde won the Heisman and was everybody's All-American in the 1986 season, including Bob Hope's. 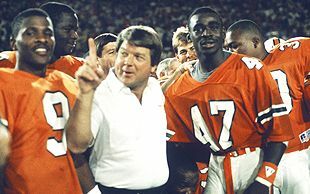 Johnson was new to the politics of the bowl picture, having come to Miami from Oklahoma State as a no-name coach in 1984. He saw no real reason for his team to leave Florida, home of the Orange Bowl, the Citrus Bowl and the Gator Bowl. His team had outscored its opponents 420-136, had already beaten Oklahoma, the defending national champion, and had been No. 1 ever since. Whoever they played, wherever they played, it would be a formality, a culmination of a season guided by destiny. What was the point in hauling across the country to play a team that might have been undefeated, yes, but had nearly lost to Cincinnati and barely beaten Maryland? So even after Meyers had secured more money from the sponsors, even after he'd coaxed more money out of NBC, even after he'd set up a fundraising banquet with Bob Hope, even after he'd delivered black satin sweat suits to the entire Miami team, and even after he'd arranged for the wives of the Miami coaches to get free treatments at a highbrow desert spa, he realized he needed one more flourish, one last appeal to the ego of a coach whose immaculate coiffure had already assumed a mythical significance. As an insurance policy, Meyers said he began calling reporters. Jimmy Johnson doesn't want to play Joe Paterno on a neutral field, he told them. Jimmy's afraid. When anyone at Miami asked him whether he might be the anonymous source making such statements, he denied it. Immediately after Miami's last victory over East Carolina, Johnson stood in front of a room full of reporters and confirmed that his team would be playing in the Fiesta Bowl, in prime time, against Penn State. With this team, why should he be afraid of anyone? TREY BAUER, LINEBACKER, PENN STATE: "As a group, they didn't seem very smart to me. No way that (expletive) would have happened at Penn State. But they were clearly at the front end of all that (expletive) you see now." STUBBS: "They were just ... bland. And we were doing things that teams are still doing today. You know how everybody puts up four fingers when the fourth quarter comes around? That was us. We were the first ones to cut our jerseys, and the NCAA made sure that isn't around no more. When we played Oklahoma, we didn't shake their hands, and now there's a rule you have to do it. People didn't respect us? We didn't care." ALONZO HIGHSMITH, RUNNING BACK, MIAMI: "Yeah, Jerome Brown had a gun on campus, and that put the program in a bad light. But they didn't mention how many of us graduated, how we weren't allowed to take those easy courses like other programs get away with. We were brash, and we did a lot of talking on the field, but if you asked the majority of college players, they wished their coaches would let them play like us." 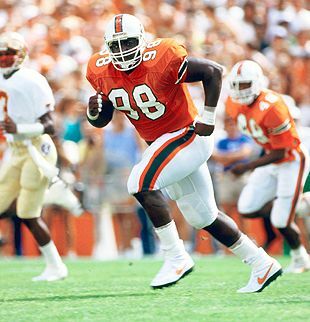 All-America defensive tackle Jerome Brown set the tone for the cocky Canes. BAUER: "They made us out to be a bunch of choirboys, but that wasn't the case, either. It wasn't like we were locked in the library 24/7." COOK: "The general feeling was that Miami was just a bunch of rogues. They made Penn State good because everyone wanted to say Miami is evil, and so it became good versus evil." The idea? Two decades later, who can remember how the idea came about? According to Highsmith, it started with a few of the seniors, like him and like Brown, the incorrigible All-America defensive tackle. And then it spread, and it became the latest outlandish brainstorm of a team that felt like it could do absolutely no wrong, even as the improprieties and transgressions mounted and the self-righteous criticism came hard and fast. They were thugs. They were outlaws. They were the Oakland Raiders of college football. So when somebody came up with this new idea, the notion of wearing combat fatigues all week long, to show the world that they meant business, that they were there to do a job, they all seemed to think it made perfect sense. Johnson and Jankovich were already out in Arizona, so the players were flying out on their own, and there was no one to tell them otherwise. It wasn't until they stepped off the plane in their fatigues and saw the Penn State players walking around in suits and ties that they realized what their outfits had wrought. This had already become the most hyped game in the history of college football, and now here was an organic story line: The bad guys had dressed the part. JANKOVICH: "I was decimated. We didn't know anything about it, and if we were on the plane, they probably wouldn't have done it. From that point on, it was really downhill." STUBBS: "People need to understand, we didn't have a dress code. It's different now, with all the teams wearing shirts and ties. While we were out there, we visited some Army base in the mountains and we bought me some medals. I was a 17-star general, because I had 17 sacks that season. That was something we did. It ain't gonna be repeated again." HIGHSMITH: "If we win the game, no one cares about it. It might be a fashion statement or something." BAUER: " We thought it was absurd. Like, what are these guys doing?" At a news conference in which he referred to Paterno -- anointed that week as Sports Illustrated's Sportsman of the Year -- as "St. Joe," Johnson affirmed that he didn't care much how his players dressed, or how they went about motivating themselves. He told the assembled horde -- and in the end, about 1,500 media members flocked to Phoenix to cover a game that was beginning to feel like a Super Bowl -- that he couldn't wait to see what they came up with next. Johnson and his perfect coiffure provided comedic fodder for Penn State at the pregame luncheon. He had other things on his mind. Meyers had never seen a coach so ... uptight. Johnson complained about the carpeting in the locker room, so at the last minute Meyers had carpenters flown in from Los Angeles to replace it with something in Miami's green. The day before the game, each team was scheduled to do a walk-through on the field at Sun Devil Stadium. Meyers called Paterno and asked him what time he wanted. "Four o'clock," Paterno told him. He called Johnson. "What time does Joe want to go?" Johnson asked. Meyers told him 4 o'clock. "Then we want to go at 4," Johnson said. Meyers called Paterno back. "We're going out at 4," Paterno said. Jankovich called Meyers sometime around midnight that night. He was upset, claiming favoritism toward Penn State. According to Meyers, Jankovich might even have cried, though Jankovich says he can't recall any of this. All he knows is that the Hurricanes were promised certain things. They wanted the bigger locker room; they got the smaller one. They wanted to be the home team, but Penn State wore its home blue jerseys. When 4 p.m. came, Miami showed up for the walk-through. Penn State never did. By then, the Hurricanes were primed to implode in a bizarre display of rebelliousness that still lingers, two decades later. Both teams attended a steak fry, where they were supposed to deliver a brief skit. Penn State's players wore suits and ties. Miami's players wore their black sweat suits, only because, Highsmith insists, the Fiesta Bowl officials told them to. The Penn State punter, John Bruno, made a couple of jokes, dragged out a garbage can labeled with masking tape as Jimmy Johnson's Hair Spray, and made a crack about how much racial harmony there was at Penn State: "We're one big family," he said. "We even let the black guys eat with us at the training table once a week." So now it was Miami's turn. Jerome Brown stood up and unzipped his sweat suit to reveal his fatigues. "Did the Japanese sit down and eat with Pearl Harbor before they bombed them?" he said. "No. We're outta here." 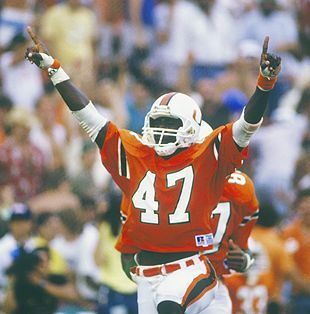 Alonzo Highsmith carried Miami's vaunted ground game. "Excuse me," he said. "But didn't the Japanese lose the war?" TIM JOHNSON, DEFENSIVE LINEMAN, PENN STATE: "When they walked out, that was the moment where the heat turned up 100 percent. I was ready to go find our locker room, suit up, and play right now. It's on. It is on." STUBBS: "We weren't there to have fun. We had some mariachi band come on our bus, and they were passing out oranges, and we were like, 'We're here to win a game.' Then we went to this steak fry and they made us put on a show, and we said we're not here to do a show. But then the Penn State players get up there and they're ripping us, and they're ripping Coach Johnson. So when it's our turn, we just said, 'Dude, we're out of here.' "
BOB WHITE, DEFENSIVE TACKLE, PENN STATE: "If you're told a lie for long enough, you start to believe it. They were talented, but they bullied people by running their mouths." JEROME BROWN (from a pregame news conference): "I think they're nothing. Shaffer thought he had a bad bowl game last year. That was nothing. After this game, he'll wish he'd graduated. The dude's about to star in a nightmare." JERRY SANDUSKY, DEFENSIVE COORDINATOR, PENN STATE: "That game took on everything that went on around it until it became more than a game." 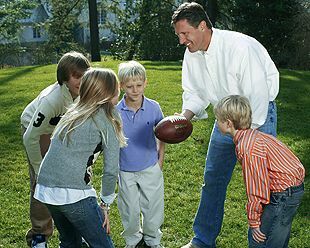 PATERNO (From "Paterno: By the Book," by Joe Paterno with Bernard Asbell): "I don't know whether Jimmy helped his kids plan their disgraceful walkout. ... But I know he was there. Nor did he raise a finger of caution when we were climbing out of our bus for the locker room as his team ... just about blocked our path, waving and taunting and yelling, 'We'll get you, you mothers.' (I'm only using half their word)." MEYERS: "By game time, it felt like the place was going to explode." Michael Irvin didn't think much of Penn State's undersized defensive backs. A year and a day removed from the only loss of his football career, a year and a day removed from the moment when he insisted on accepting the blame for his team's 25-10 defeat to Oklahoma in the Orange Bowl, John Shaffer walked onto a field in Tempe and tried not to think of anything except the first play of the game. It was going to be a pass. They were going to throw on first down, to try to catch Miami off guard, and then Shaffer found himself distracted by the presence on the sideline of David Hartman, one of the anchors of "Good Morning America," who had been hanging around all week. And he saw all these famous alums from both teams -- Kenny Jackson, Curt Warner, Todd Blackledge, Jim Kelly -- and the whole thing began to sink in: This was bigger than last season. This was bigger than any college football game he had played in. This was bigger than any college football game anyone had ever played. For a few more moments, they had to muzzle themselves. Miami's Irvin walked over to Penn State's undersized safety, Ray Isom. "You're Isom?" he said. He was laughing; all week, Miami had been ridiculing Penn State's defensive backs, likening them to Smurfs -- they were too small and too slow to cover Irvin and Brett Perriman and Brian Blades. Penn State got the ball first. Shaffer called that pass play. Then he looked in the eyes of his offensive linemen, and they were glassy and unfocused. They're not here yet, he thought. He took the snap, faked a handoff to his All-America tailback, D.J. Dozier, and dropped back four or five steps. One Miami lineman, Winston Moss, came charging in from the outside, unblocked. Shaffer ducked, Moss overran him, but here came two more linemen, charging straight into him. Shaffer wound up twisted in the grass, 14 yards behind the line of scrimmage. He never had a chance. It would go like this all night for Penn State's offense. They could not throw the ball, and even behind Dozier, they could not run the ball either. At the end of the first quarter, they had seven total yards. Shaffer finished 5-for-16 for 53 yards. They managed only one sustained drive, of 74 yards, which ended in an ugly dive by Shaffer to tie the game at 7-7 in the second quarter, and negated Shaffer's only crucial mistake of the game, a fumble deep in Penn State's territory that led to Miami's first and only touchdown. That Nittany Lions drive accounted for nearly half of their 162 yards of total offense; Miami would finish with 445. Melvin Bratton gave Miami a 7-0 lead in the second quarter, but the Canes failed to reach the end zone again. And all of this was fine with Paterno, and it was fine with Sandusky, because they had built this team on a philosophy that, two decades later, has begun to seem more and more quaint: You win with defense first, and you win with special teams second. And all your offense has to do -- and all your quarterback has to do -- is avoid screwing the whole thing up. SHAFFER: "We really trusted authority. We felt like if we listened to the coaches, we'd be successful. And our offense was very comfortable taking a secondary role. I think for a young head coach today, with all these wide-open offenses, it would be very hard to win that way." BAUER: "When I watched the film, I remember thinking, 'Are these guys that good or are the teams they're playing that bad?' It looked like a flag football game. But we had a veteran defense, and we had six weeks to prepare. We had 150 different looks on defense just for that game." SANDUSKY: "They weren't very concerned in warm-ups. I remember Vinny and Jimmy coming over to check out our defensive backs and I'm thinking, 'Man, I wish we looked more impressive.' "
STUBBS: "I'm a Jersey guy, and the one thing I knew about Penn State was that their defensive backs could hit. They crushed Michael on one play, and he came to the sidelines and I said, 'I told you so.' "
BAUER: "Irvin got totally jacked up early in the game by one of our guys. I mean, he got hit. And I don't think he did much of anything the rest of the game. I think in the press conference afterward, he said the ball was slippery or something." Sometime around the start of the second quarter, the talking subsided and this game settled into a rhythm: Penn State stalls, Bruno punts the ball deep into Miami territory, and Miami turns the ball over. At halftime, Bob Costas conducted a rambling interview with President Reagan. Meyers' vision had come to fruition. The ratings were enormous, larger than even the network could have expected: 25.1 percent of households with televisions (more than 70 million viewers) were tuned to NBC that night; no college football game has gotten that kind of ratings share, before or since. In the third quarter, All-America linebacker Shane Conlan made an interception for Penn State, then stumbled and fell on a bad knee that had been bothering him all night long. After Penn State gave the ball back, Miami missed a field goal. Linebacker Shane Conlan collected two of Penn State's five interceptions of Testaverde. Conlan was forced to leave Miami's final drive of the game with a knee injury. On the first play of the fourth quarter, linebacker Pete Giftopoulos made an interception. Then the Lions missed a field goal. Penn State was rushing three men and dropping eight, and instead of running the ball with Highsmith, Testaverde kept throwing. He threw into coverage. He threw to the wrong man. His receivers dropped passes. Even so, Miami went up 10-7 on a field goal with 11:49 remaining because Penn State simply could not move the ball either. On Penn State's next possession, Jerome Brown sacked Shaffer, leapt up, and saluted the crowd. The swagger had returned. 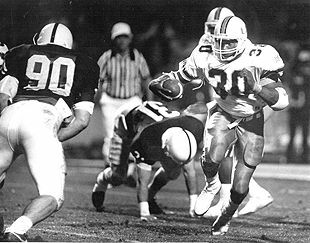 But after another Bruno punt, Testaverde, looking as perplexed by Penn State's shifting schemes and coverages as he had all night long, threw another pass directly into the arms of Conlan, who returned it to the Miami 5-yard line. Dozier scored, dropped to a knee and said a prayer. Penn State led, 14-10. Shaffer left Tempe with memories and mementos that no one will ever take away from him. Both defenses stood up once more. Miami tight end Alfredo Roberts fumbled the ball away, but Penn State could not manage a single first down and Bruno punted the ball back with 3:18 left. A minute later, after Bauer dropped a potential interception, Miami was facing fourth-and-6 on its own 26-yard line. And then, as if perhaps they had both finally awakened from an evening's slumber, Testaverde found Brian Blades for a 32-yard gain. 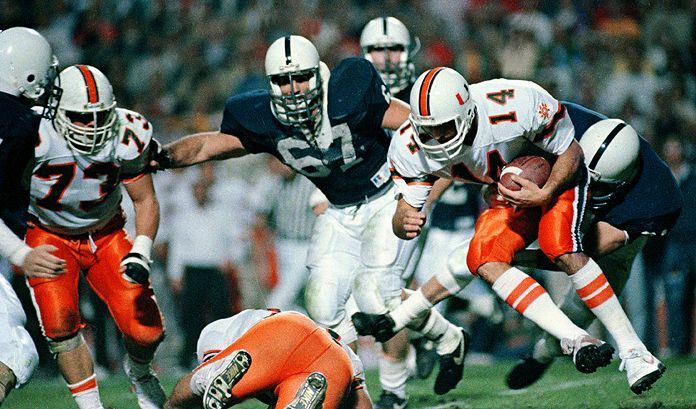 Soon the Canes had moved to the Penn State 26, and then Testaverde hit Irvin at the Penn State 10 with a minute left. Conlan went down on his bad knee, stopping the clock. Testaverde hit Irvin again, and it was second-and-goal at the Penn State 5 with 45 seconds left. SANDUSKY: "After Conlan got hurt, Bauer came over to the sideline. He looked at me and I said, 'I can't help you. Good luck.' Then I asked Trey if he knew what to call if they went without a huddle and he said he did. And then he got lockjaw." BAUER: "That's (expletive)! The coaches were confused! They never sent in the play!" STUBBS: "On the sidelines, we're all saying we should run the ball. Run a delayed draw to Alonzo, and he'll carry somebody in to the end zone. But Vinny wanted to throw." HIGHSMITH: "To this day, I have no clue what happened. All I know was they weren't gonna stop me that day. 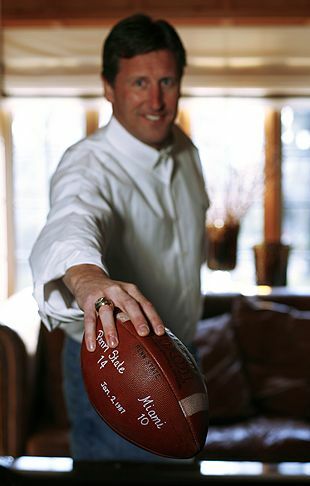 I always figured I'd get one or two carries on the goal line." On second-and-goal, Testaverde dropped back, and Tim Johnson burst through the line, wrapped an arm around Testaverde's neck and sacked him. On third down, Testaverde dropped back again, and threw incomplete in the flat. And on fourth down, with 18 seconds left, Testaverde dropped back once more, looking for ... well, who knows? In one last burst of confusion, he threw left, toward the end zone, toward several Penn State players, and Giftopoulos, the soft-spoken linebacker from Ontario, Canada, intercepted his pass -- Testaverde's fifth interception of the game, and Miami's seventh turnover -- and then, not knowing what else to do, started to run aimlessly, like a foal lost in the woods. Pete Giftopoulos, here collecting a sack of Testaverde, sparked the celebration in Happy Valley with his last-second interception. SANDUSKY: "I've always prided myself on being able to handle pressure, but on that fourth down, I couldn't even speak to make the defensive call. When it was over, I just walked over to the bench and sat down by myself and started to cry." SHAFFER: "Joe was going crazy to get people off the field, because there was still time on the clock. We had to snap the ball once more, and I told our center, Keith Radecic, just hold the ball up and don't move your hand." BAUER: "I lost 12 pounds that night. Afterward I couldn't go out, I couldn't celebrate, I couldn't do anything." COOK: "I had picked Penn State to win. But I was one of the only ones. A few years ago, I saw Joe at a dinner and he told me, 'To this day, I still don't know how we beat Miami.' There's always a game that every Hall of Fame coach loses and wakes up years later at 2 a.m. in a cold sweat thinking about it. For Jimmy Johnson, this was that game." MOSS: "We thought we were the superior team. And I still feel that way. But we've won, what, four titles since then? And we won the next year, in '87." STUBBS: "The next year they made us sign some paper, saying we'd be good. I don't even know what it said. I just signed the (expletive)." COOK: "That game did cement Miami's reputation, though. And they still pay for it. A lot of it is unjustified, but it's true -- that was the college football equivalent of the scarlet A." SKINNER: "Not only did it mean a lot for both programs, but I think it really implemented the idea that we need to have a national championship game. It was a big domino, at least for the BCS." Joe Paterno's team had only eight first downs and was outgained 445-162, but the Nittany Lions still left Tempe with the national title. Of course, even today's BCS system is deeply flawed. Games like this do not take place every year, and even when they do, the hype is often manufactured and artificially inflated. Rarely is the contrast so stark, so obvious, and rarely is the game so competitive, and rarely is the emotion so palpable. To play with a swagger, to high-five and taunt like those Hurricanes once did -- this is, for better or for worse, the rule, not the exception. So much so that even Penn State, long an oasis of high-mindedness, is no longer immune from harboring such an attitude. Two decades later, the game has changed, both because of and despite what happened that night. But one thing has not changed: The anonymous quarterback, one of the last of a breed nearing extinction, still has trouble proving his worth. Not long ago, Shaffer watched the most important football game of his life with his son, and while they were watching, his son turned to him and said, "Did you actually talk to Joe Paterno?" Michael Weinreb is a freelance writer in New York. He is the author of "The Kings of New York: A Year Among the Geeks, Oddballs, and Geniuses Who Make Up America's Top High School Chess Team," which will be published in March by Gotham Books.